Mindfulness-Based Childbirth and Parenting (MBCP) is a program which teaches skills to prepare for the profound transitions of pregnancy and birth as well as skills to help us cope more gracefully with the stresses of life, allowing us to experience the joys of parenting more fully. Mindfulness is being studied in many contexts and research shows wide-ranging benefits including reduced stress, increased immune function, greater relationship satisfaction and decreased chronic pain. Specific to pregnancy and parenting, a pilot study of the MBCP program conducted by researchers at UCSF found increases in mindfulness and positive affect, and decreases in pregnancy anxiety, depression, and negative affect. Two other studies, published in 2014 and 2017 also showed the week-end Mind in Labor class to have positive effects. ~The Greater Good Science Center published an article about the benefits of mindfulness during pregnancy. 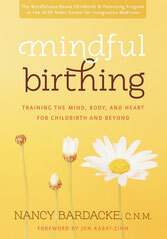 ~Mindful Birthing: Training the Mind, Body and Heart for Childbirth and Beyond received the Best Book of the Year Award for 2014 from the American College of Nurse-Midwives. ~ParentMap featured a blog post about MBCP classes starting in the Northwest. ~ The Greater Good Magazine also featured Mindful Birthing in this article. ~ Mindful Magazine included an article MBCP in the August 2013 issue. Available on Amazon & at bookstores everywhere.